Hugi Magazine #33: MP3 Power - A Weird Image! In lieu of the caption competition, as the response for the last one was not up to much! Okay people, here's a little bit of back-story for the bizarre picture I'm going to give to you for this issue of Hugi. Last Spring, I was made redundant from my job at the time, but not being disheartened, I managed to quickly find some temporary employment at the local city council offices, the planning department, to be exact. Part of the job was to take a first look at the newly arrived daily correspondence, scan it in, as all our records were being kept electronically (I was taken on to help in an archiving project for all the old stuff) and decide on where it should go next. Apart from the run of the mill stuff, we occasionally got the odd piece of correspondence which gaily skipped outside of the boundaries of normality. This image is of one of these. Now I'm still trying to work out if the writer is deliberately living in a post-literate age as an act of cutting edge wit and irony, or perhaps missed out the whole tedious school thing altogether, which is rather more likely, and almost the approved thing to do at the school I went to, or even if this is the first authentic written example of "Chavspeak" written on paper, rather than as a text message? Let's have a shot at translating, shall we? Starting with the original statement, word for word. 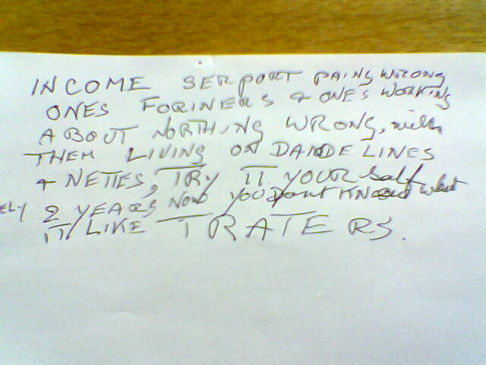 "Income serport paing wrong ones foqineers + ones working about nothing wrong, with them living on dandelines + nettles, try it yourself ely 2 years now and you dont know what it like TRATERS." "Income support are paying the wrong ones, foreigners and people working. There's nothing wrong with them living on dandelions and nettles. Why not try it yourself. It's been nearly two years now, and you don't know what it's like, TRAITORS!" Which just leaves one last question, why are racists always coming across as so droolingly braindead? !